Each Citizen has their own shell necklace (the symbol of the Camino) and passport to get stamped, and are contributing $1.00 from their paychecks for every mile they walk to raise money for the new Brookwood Bike Pavillion. A donor has generously offered to match the Citizen’s $300 and other donations up to $5,000. Click below to support the Camino. Way to go Jana and the Brookwood Citizens! We are in Pedron. It is midnight Houston time and we are heading out. We arrive in Santiago later today for the Pilgrims Mass at the Cathedral of St. James. We have our longest walk of the week and another climb. It will take us all day with our anticipated arrival about 5:00 pm in time for the Pilgrims Mass and the special part when they swing the incense. I can already feel the emotions rising inside of me as I look back on these past three weeks and arriving in Santiago for the Mass. It is a wonderful moment too when you see the other pilgrims you have met from around the world at the Mass also. I have pictured this moment for so long and can’t possibly imagine starting my 65th year in any other way. I am filled with such gratefulness. Can still hardly believe I have walked this distance from Lisbon, Portugal to Santiago, Spain!!! I know everyone’s prayers have supported me and kept me going. There have been days I have walked with blisters, achy legs, sore feet and feeling very tired wondering how can I possibly get up and walk another day. The Citizen photos and videos I received at the beginning of the week could not have arrived on a more perfect morning when we were getting ready to head out. I was feeling extra tired and just looking at the photos and videos a number of times before I left made me smile and laugh every time. I loved it, Greg, when you said even the dogs are walking!! The Citizens inspired me, encouraged me, energized me and kept me smiling all day thinking of them. Wish you were here to experience this walk with me although I feel as if you have walked every step of the way through my thoughts and prayers for all and the Brookwood Community. Thank you again for your prayers, excitement in sharing this special time with me, your encouragement and support. It has meant so much. Will send more pictures when we arrive in Santiago. Have a great Labor Day weekend. Second day out from Tui, Spain as a group of six pilgrims…a great day! We started with a 2-mile continuous uphill walk through small hamlets, family size corn fields and grape orchards. The walk leveled off for a bit however at least 75% of the walk today was uphill. And there were two downhill segments that were very steep and somewhat challenging. The weather was clear skies and mild all morning and it warmed up to about the mid 80s just past noon. A 15 degree drop in temperature this week has made a big difference! We broke for lunch late about 1 pm on the side of the road with a low granite wall. There is a local granite quarry and all the fence posts, grape orchard vertical posts, fence material and any kind of outside wall is granite. Some of the granite walls, fences and posts looked like they have been there forever, and some are new. We all have some aches and pains and even blisters but we tend to focus on where we are walking, the incredible beauty of Spain and the friendly people willing to help us, especially when we are lost, enabling us to not focus on our pain. Jana and Karen walked into the hotel lobby in Tui just as Louis, Ron and Warren arrived and began checking in, great timing. Unfortunately, Guy Clifton was not able to make his connection from his flight from DC to Lisbon to his flight to Vigo with Louis, and had to catch a couple of trains to get into Tui about midnight Friday. The five of us had a great dinner on a street side table at a café along one of the cobble stone streets that wind up and down the hill near the cathedral, at the top of the hill. Too good! Saturday is a rest day for Jana and Karen and a decompress day for the four of us who just arrived in Spain, so we walked across the river back into Valenca, Portugal to tour the town and the fortress along the river built in the middle ages that protected the Portuguese from the Spaniards to the north across the river. With two priests on our team we will have a private Mass tonight and then break for dinner. Tomorrow, Sunday, we will start the 6 day last leg of the Camino into Santiago, with the first stop in O’Parrino just north of Tui. The two priests are Ron Rolheiser, President of the Oblate School of Theology in San Antonio Tx and Warren Brown, head of the Oblate Order for North America who is stationed at the Vatican in Rome. Ron, Warren, Karen and Jana walked 350 miles of the Camino Frances together in 2012. The weather today was in the high 70s and low 80s, a far cry from the typical heat up to this time, hopefully it will hold up for our first day all together as a 6-pilgrim team. 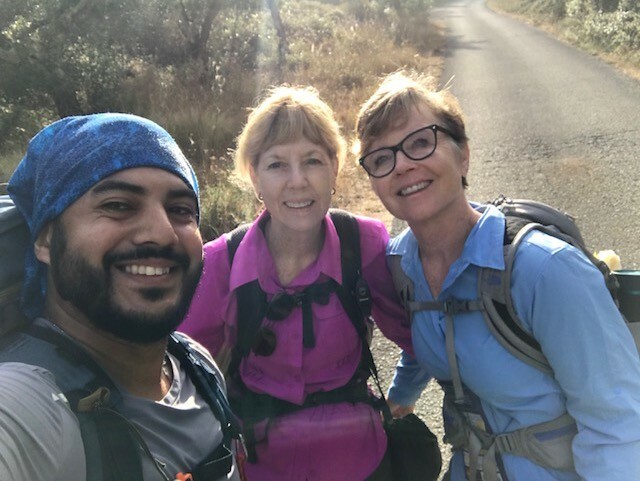 There was a really big reaction from many people to the “Camino de Brookwood” and how all the Citizens are doing their own Camino and in their minds are following in Jana’s footsteps each day of the journey. Please feel free to share the Brookwood Facebook page on this matter and spread the word, the Citizens are on a mission to raise money for their long awaited new Bike Barn, and they love walking the Camino alongside of Jana each day. The girls have had a few difficult days since Day 10, they have been dealing with high temps (in the mid 90s) with no protection from the sun, and long days, and mountainous ranges. They leave really early to get as much in as possible before the heat gets to its most difficult stage in early afternoon. They have walked through some beautiful areas and the pics show it clearly. The good news is that I arrived in Lisbon this morning and had a day to myself here in the heart of Lisbon, staying at the same hotel that Jana and Karen stayed last week. Guy Clifton (Karen’s husband) arrives on the same 10:25 AM arrival from Dulles tomorrow and we both catch a 12:20 pm flight to Vigo where we will meet up with Ron and Warren who are flying into Vigo from Madrid. We have a transport arranged for the four of us into Tui Spain where Jana and Karen will arrive via foot to join us. I am here ready to finish this Camino with Jana, i have walked over 250 miles the last three months getting ready for game day, which is this Saturday when we all start the last week together. Sent my previous text a little too soon!!!! Just after I sent it, we started walking, the overcast clouds cleared, and the sun and heat just about killed us. It was unbelievable to say the least. We made it to the top over a very rocky path and met some bikers climbing this mountain too (with their bikes !) on their way to Santiago. I still don’t know how all these bikers are doing it and there have been quite a few of them. I told them about Brookwood and the Citizens and how much they love to bike, walk and stay fit. They wanted to say Hi and to tell the Citizens to keep biking and walking! We have met many wonderful people from Germany, Holland, Italy, France, Belgium, Portugal, Netherlands,Israel, Spain, and our first person from the U.S.A. today. He lives in Golden, Colorado. We are definitely one of the older ones we have seen walking the Camino with the exception of the man from Belgium. Maybe it will be different in Spain. The majority seem to be in their 20’s, 30’s with a few of us “older people” scattered here and there. It has been an amazing “very hot” two week journey and I wish you could be here to be a part of it too. We cross the border into Spain tomorrow. God is everywhere you look, in every person we meet, and in everything we do!! Just no words to describe it! Grateful for the gift of this journey. Thinking of everyone at Brookwood, hope all is well and thank you for your prayers. Here is a link to the Brookwood Community Facebook page, scroll down to a post on 8-15 with a Picture of Jana coordinating the Camino de Brookwood before she left. The citizens are walking their own Camino there on the grounds and are raising money for their new bike barn, check it out! The day to remember yesterday was full of events, starting with a driver transporting them to the wrong city so they could walk along the coast, trying to get back on track after that, multiple misguided detours during the day, and they found themselves far away near dark and someone they asked for directions gave them a ride to their hotel arriving about 8:30 pm. It is still very hot she said, in the mid 90’s, and the sun has been a challenge. They had a great walk along the coast line and were saved by a sudden significant drop in temp in the early afternoon that enabled them to continue more easily. After a day of rest and recharging, pretending to be tourist in Porto yesterday visiting Port wine wineries, etc. the two pilgrims got back on the Camino today. I did not get to talk to Jana but only got a text about 11 pm their time. She said that they did not get into town till after 8 pm and said it was a “day to remember”; I think that was meant in a challenging way. I remember looking at the maps of the terrain north of Porto and it appeared to be more difficult. I will get the details tomorrow I am sure; she did say it was the first day where they actually got to walk along the coast though. Only talked briefly to Jana today as I was in meetings when she first called, and it was about 11 pm her time when we she finally called back. I could tell she was really tired, even so she managed to send a lot of great pictures before she went to sleep. Tomorrow they will catch a train from Coimbra into Porto, about 85 miles away i believe. Porto is like the #2 city in Portugal I believe. Traveling tomorrow will be somewhat of a break, and they have Saturday as a rest day in the great city of Porto before starting the second week of the walk. I will bet a lot of money that they sleep late on Saturday because they have been getting up at 5 am daily to get an early start to avoid the heat that has persisted. They have had two great days in a row, great weather, somewhat hot again, but clear skies in mountainous elevations. Hotel room last night was not so good, but apparently the one tonight makes up for it! The first couple of days they did not run into any other pilgrims, but the last couple of days they started to encounter more. The Camino Frances has about 300,000 pilgrims annually and the Camino de Portuges has only about 10,000 pilgrims annually, the second largest number but a distance second. They seem to be getting into a rhythm and managing to get into town at the end of the day earlier and being able to enjoy the end of the day more. They encountered Church and national Festivals for August 15th along the walk today and were able to join in the fun it sounded like. These are pics from yesterday, I did not get any today. Jana reported having a great day today, the weather broke, and they had temps in the upper 70s and low 80s, big change from the last two days. Plus is was breezy all day with clear skies. Even though they were going through higher elevations the climb was gradual but steady and so it was not as difficult as they anticipated. Part of the way is just paths like below and some along the highways. They completed a very difficult day today because of the heat, a mountainous area, and a long distance. They will have even higher elevations for tomorrow she said. Hiking through a farming area early in the day with an abundance of bell peppers she said. Her battery went out in the afternoon so we did not get any pics from the mountain area. They are heading to Alvaiazere tomorrow. Just got a text from Jana that they have completed their first day on the Camino. She said it was very very hot, but over all they had a great day and hit the jackpot with a great hotel room for their first night. They are out to dinner now and will most likely crash right after that! On the map attached you will find the Day 1 marked on the map and I will update this map with their progress each day.